As the importance of an online presence continues to increase, you may have realized that your business could benefit from Google My Business. You may be wondering how to best present your brand online, or you may be looking to improve your existing Google My Business account. You’ve come to the right place. Smartz offers you this simple guide to Google My Business. OK, let’s start with the basics. What is Google My Business anyway? Google My Business (let’s call it GMB) is a game-changing feature that Google offers for free to be used by legitimate businesses. GMB contains many helpful features that allow you to showcase your business to curious searchers. Most importantly, it is your official business listing for the Google Search Engine. With GMB, your business listing will show up when customers search for your business online either in Google Search or Google Maps. GMB also lets you showcase images of products, your physical location, or other things, it also allows you to post updates and highlights about your business. You can display your address, contact information, and hours of operation in an easily accessible format. Think of GMB as your very own front desk of the internet. In addition, Google My Business gives you access to make changes to your listing anytime. If your hours of operation changes for any reason, such as seasonal hours or a holiday, you can adjust them quickly, and the changes will be automatically updated across all Google platforms. You can add photos and images to your account. Show off your products, entrees, building, and more. You can add as many photos you like so you don’t have to be shy about showing off. Google My Business allows you to hold a two-way conversation with your customers. Besides this, you can answer questions your customers may ask before they ask them. Post commonly asked questions in the Q/A section of your listing. Google now offers a simple, custom website using a free platform that is easy to use. Google walks you through the creation process to create a great looking website specifically for you GMB account. You can create and edit at any time through a computer or phone, and it’s completely free! Do you operate a hotel or other business that uses a booking system? 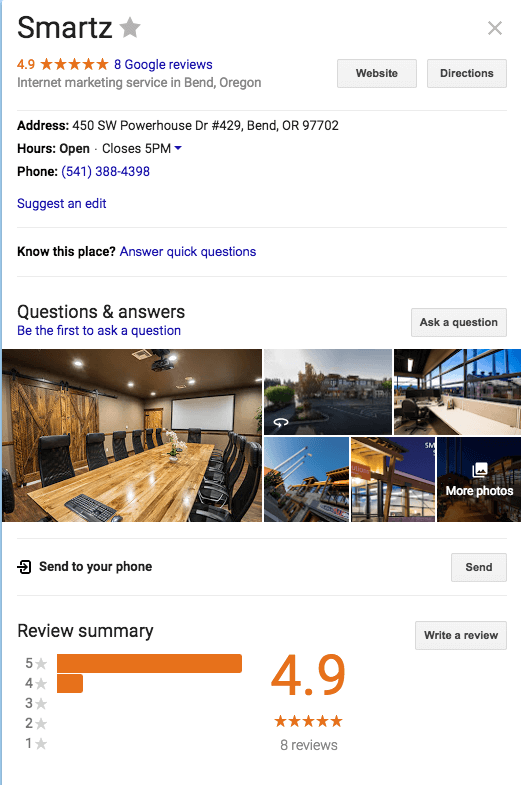 Google My Business lets customers book directly from your GMB listing. Integrating booking services is easy and drives more conversions. Google connects with your scheduling partners to track all bookings that come from your listing. Insights is a powerful Google My Business feature that tracks how customers are finding your listing and how they are interacting with it. Insights can help you understand who your audience is and what they are looking for so you can adjust your listing to better meet those needs. With Google Insights, all the answers you need are made plain within your GMB account. Where are customers searching for? What features are they clicking on? What photos are being noticed? These and many more questions can be answered in your GMB account. Setting up your Google My Business account is easy! Unless your business has just opened, you should already have a Google listing. Doing a simple Google search for your business should tell you quickly if you do. You can get started creating your account by claiming your business as your own. The simplest way to do so is to visit the Google My Business site and click the Start Now button. If you need help verifying your business, Google has some helpful instructions on how to do this. If you are claiming your business listing for the first time, or you are looking for ways to improve upon your listing, there are a number of simple things you can do to get the most out of GMB. After claiming and verifying your business in GMB, then the real fun begins. Check Your Listing Regularly Because your Google listing is fluid, anyone can suggest a change be made to a GMB listing. Therefore, it is important to check on your listing. Every day if you can. This way, you can monitor any inaccurate or unwanted changes that have been suggested by users. If anyone has suggested a change that requires your approval, you will be able to see notifications of pending requests. Use Google My Business Posts – Be sure not to overlook the post feature of GMB. Posts are an excellent way to reach out to your customers and let them know what’s happening with your business. Do you have an announcement to make? Are your hours of operation changing? Do you have a new product you want to advertise? Posts appear below your business listing an act as a mini ad. Make your posts stand out with a featured image, a call to action, and links to other web pages. Make Your Listing Interactive – Try using the booking button feature, if applicable, fill out the Q/A section to answer frequently asked questions, and use messaging to directly respond to customers online using a phone number. The Google Allo app allows you to connect without a phone. Messages will be sent to your GMB account rather than a message inbox. Ask Customers for Reviews – You must be very careful to follow Google’s guidelines for asking for reviews. That being said, ethically asking customers for reviews is a great way to build up brand trust and notoriety online. Reviews are known to affect search results and ranking. Be sure to respond to every review you receive, no matter if it is good or bad. Thanking customers, answering questions, and smoothing things over when needed all contribute to the quality and strength of your listing. With these helpful tips, you should feel inspired to create a Google My Business listing all on your own. Get started now and do more online with Google! If you have questions about setting up your account, improving your account, or using various features, contact Smartz to get the information you need to move forward. Previous article: What is the Google Guarantee?